Just like people and storage facilities, storage units come in all shapes and sizes. You need storage, so it is time to consider the exact storage unit that meets your needs. When selecting a specific storage unit you must consider the size and shape of the space that will work best for you. Here are some tips to help you make the best decision. SIZE: When thinking how much space you require, again, consider the frequency of access. For frequent access it is best to get a larger storage space. When you store business inventory or when you are moving, you will likely access your storage unit often – possibly more than once daily! A bigger storage unit gives you the extra space you need, making frequent visits more convenient. More space means more room to move. Rearranging boxes or just checking their contents is easier when you have the space to operate. A larger storage unit also means you can better see your stored items. Having a light in your storage room doesn't help much if your boxes are tightly packed to the ceiling! A larger space also means better access to those items. You can install shelves in your space or organize your stored items into sections for easy inventory and retrieval. Smaller storage spaces are better for infrequent visits. When you store things such as seasonal items, you don’t expect to be accessing your stored items on a regular basis. In these cases you can get a smaller unit and stuff it to the gills! However, with a smaller space you may have to remove many items to find what you are looking for. But, you won’t be coming to storage that often and the few dollars you save with a smaller space might make it worth the extra time. SHAPE: The shape of your storage unit should depend on the shape of the items you are going to put into it. Some storage units are skinny and long, some are perfect squares, yet others may be wide and shallow, and each shape has its advantages. Square and rectangular shaped units are the most common you will find. They generally work well for both business and household renters without any irregular items. Wide storage units generally allow for easier access to your stored goods, especially if they have roll-up doors. Wide doorways allow you to place the items you need most often at the front while other items remain out of the way. This is especially helpful for storing large items or for those seeking frequent access because you won't have to take everything out and then put it all back in each time you visit your storage space. Storage rooms that are long but skinny are better for storing items that need the extra length. A business with inventory on shelves would do well to rent one of these spaces, for example. Other uses would include storing long pieces of pipe or conduit, long pieces of furniture, or even storing several motorcycles. 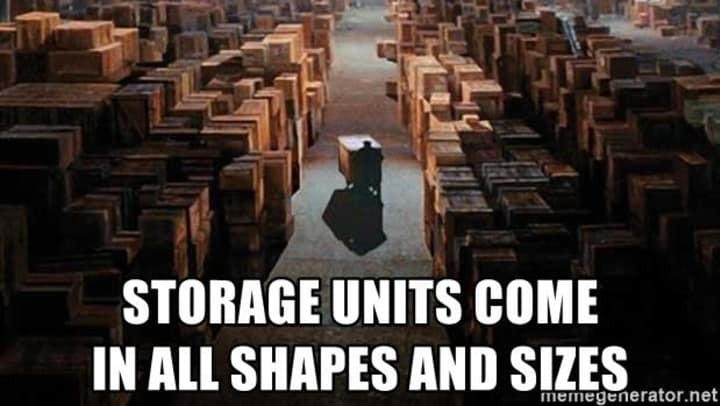 Also be aware that those odd or irregular shaped units may come at a discount - another reason why you should consider shape when choosing the storage space that is right for you!